University of Rochester Life Trustee Alan Batkin ’66 and his wife, Jane, have established a professorship in Jewish studies. Their generosity will help strengthen academic and research activities in Jewish studies, furthering the understanding of Jewish history, culture, language, and religion across the University and beyond. The couple made the gift in honor of two milestones: Alan’s 50th class reunion and the couple’s 50th wedding anniversary. 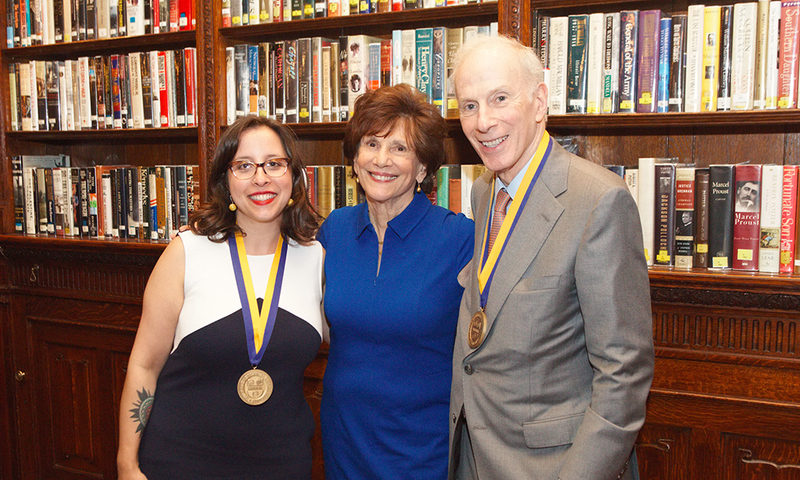 In recognition of her scholarship and teaching acumen, Nora Rubel has been named the inaugural holder of the Jane and Alan Batkin Endowed Professorship in Jewish Studies. Rubel is also an associate professor of religion at Rochester and director of the University’s Susan B. Anthony Institute for Gender, Sexuality, and Women’s Studies. Rubel earned a master’s degree in religion and culture from Boston University and her PhD in religion from the University of North Carolina at Chapel Hill. A faculty member in Rochester’s Department of Religion and Classics since 2007, she is the author of Doubting the Devout: The Ultra-Orthodox in the Jewish American Imagination (Columbia University Press, 2009), a coeditor of Religion, Food, and Eating in North America (Columbia University Press, 2014), and the author of multiple journal articles and essays. Alan Batkin is the chairman and CEO of Converse Associates, a consulting firm, and currently serves as a life trustee of the University of Rochester. An alumnus of the University, he earned his bachelor’s degree in industrial engineering in 1966 and continued his education at New York University, receiving his MBA in 1968. Along with his wife Jane, a retired school psychologist who currently facilitates bereavement groups for children, Alan remains active within the University and throughout his community. He currently sits on the board of four public companies and is an active board member of numerous non-profits including the Brookings Institution, the International Rescue Committee (where he is Chairman Emeritus), MD Anderson Cancer Center, the Columbia Mailman School of Public Health, the Mass General Center for Global Health (which he chairs), and the New York City Police Foundation. Jane is a member of the advisory board for the Greenwich (Connecticut) Hospital Women’s Health Initiative and serves on the board of the Breast Cancer Alliance, the Greenwich United Jewish Appeal Federation, and the YWCA of Greenwich.